It is striking that in four decades the debate around improved and local paddy varieties has remained almost unchanged. It is astonishing to see how the article in The Guardian published in September 2017, “Why India's farmers want to conserve indigenous heirloom rice”, uses exactly the same arguments as those Nepalese farmers were putting forward in the 80s when they were asked to explain why they were not adopting the improved paddy varieties of the Green Revolution. In nearly 40 years, nothing seems to have changed and it looks like governments and researchers - whether public or private - have remained deaf to the arguments and needs of farmers, particularly of those part of the mass of poor farmers, and have preferred to give top priority to short term paddy productivity measured in terms of calories produced per hectare. In the meantime, over the past period, a sizable part of the more than 100,000 local paddy varieties of the Indian subcontinent disappeared, a net loss of biodiversity that, one day, may prove of a extreme importance as, who knows, among the genes of the lost varieties, there were some with a decisive potential that are now gone for ever and that may have been in terms of capacity to resist to pests and diseases, to adapt to extreme environmental conditions - excess or lack of water, high temperatures, degraded, salted or polluted soils - or because of the presence of molecules that may have invaluable medicinal properties. More varieties could have been lost under the pressure of the so-called “improved” or “superior” varieties that are promoted by governments and large seed multinationals, if peasant farmers that not, on their own initiative, established gene banks for agricultural plants and sensitised their colleagues to the advantages of agrobiodiversity, including nutritional benefits, sometimes with the support of NGOs such as Gene Campaign assisted by FAO, in the State of Jharkhand at the beginning of this century (see photo below). 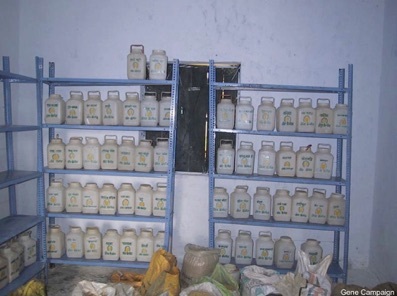 A village gene bank in Jharkhand, India. What are the arguments in favour of local varieties put forward by South Asian farmers? •contrarily to improved varieties with short stalks, local paddy varieties are longer and provide important by-products: straw can be used to feed animals, to mulch the soil and for thatching the roofs of traditional houses. This tells us and tells government officials, researchers and seed producers that for small farmers of the subcontinent, rice is “more than just a bundle of calories and starch”. 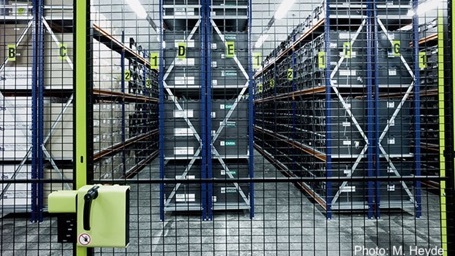 These are arguments in favour of the conservation of local varieties, whether by creating modern gene banks where seeds are well kept (see photo of the Svalbard Global Seed Vault, below) or by removing incentives to use the so-called “improved” commercial seeds that are developed with in mind only their productivity in terms of calories per hectare, not accounting for other aspects such as the quality of the produce obtained for consumers, by-products and hardiness, nor for the negative externalities such as soil degradation and pollution by agrochemicals. Arguments put forward in this debate by small African peasant farmers would not be radically different from what has just been seen in South Asia. Maybe the ease with which food is prepared and particularly the behaviour of grains when they are pounded (in the case of maize, millet or sorghum) and, in good years, the capacity of grain to ferment well and produce good quality traditional beer (especially for sorghum) would be additional considerations. What will the debate on this issue be 20 or 30 years from now? It may not be relevant any more, if local varieties have disappeared. Let’s hope not, and that governments will implement more effective programmes to conserve and promote local varieties and that they will refuse the type of seed legislation that is promoted by multinationals and, in Africa, by the New Alliance for Food Security and Nutrition that seeks to forbid farmer exchange of traditional seeds in order to provide a seed oligopoly to multinationals and their local subsidiaries. •Choudhury, C., Why India's farmers want to conserve indigenous heirloom rice, The Guardian, 2017. •Commission on Genetic Resources for Food and Agriculture, FAO, Website. •Genebanks and germplasm health units, CGIAR Website. •The global food crunch: myth or reality? 2018. •The European Union investigates on the New Alliance for Food Security and Nutrition, 2016. •Are existing food and agricultural policies supportive to local sustainable food systems? 2015. •Genetic resources: acceleration of privatisation of living organisms is a threat to food security and biodiversity, 2014. •Green revolution in Africa: more improved seeds for the continent, 2014. •Seven principles for ending hunger sustainably, 2013.